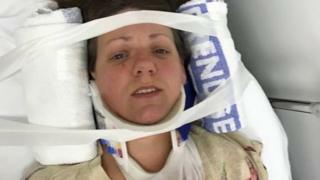 A mother has said she and her children are "lucky to be alive" after a hit-and-run incident on a country lane. The back of Joanne Wharf's car was hit as she swerved off the road to try to avoid a head-on collision with another car near Wisbech, Cambridgeshire. More than 1,300 people have shared her Facebook appeal for the driver to "do the decent thing" and come forward. She said her son, three; her daughter, nine; and her daughter's friend, 10, were in shock but not badly hurt. Cambridgeshire police confirmed officers were called at 20:00 BST on Wednesday to reports of a collision in Mouth Lane, near Guyhirn, and that the force was investigating. A spokesman said: "One of the vehicles left the scene, but there was no immediate danger or threat to life. "Information from the ambulance service suggested there were no injuries, but the victim was shaken up." The Facebook post on the Wisbech Discussion Forum page said: "To the person who hit into my car and drove off without even checking to see if anyone was hurt. "You might be interested to see a current picture of me. You might also be interested to know there were three children in the car. You hit into us at such a speed we are all lucky to be alive." Ms Wharf, whose red Seat Ibiza was badly damaged, said: "We went round a blind bend on a very narrow road and there was a car going so fast I just grabbed the steering wheel and swerved on to a grass verge. "I managed to avoid a head-on collision by a pure miracle. I was gobsmacked to see the other driver put their foot down and drive off. "We're mostly just battered and bruised and should be OK in a week or two."